Read about how you have surgery to remove an area of cancer from the breast. Removing an area of cancer from the breast is called wide local excision or lumpectomy or breast conserving surgery. The surgeon removes the area of cancer and some of the surrounding breast tissue. They leave behind as much normal breast tissue as possible. You usually have radiotherapy after this surgery. This is to destroy any cancer cells that may still be in the breast. During the operation, the surgeon removes the cancer and a border of normal breast tissue all around it. They might also remove some or all of the lymph nodes in your armpit (axilla). They send these to the laboratory. A pathologist checks the border around the tumour for cancer cells. If there are no cancer cells, your report will say that that there is a healthy or clear margin. It is important to have clear margins with any surgery to remove a cancer. It means that the doctors can be reasonably sure that all the cancer has been taken away. So the risk of cancer coming back in the future is lower. You might need more surgery if there is no clear margin around the cancer. You’ll have a scar on your breast. You can’t usually see this when you wear a bra or swimming costume. You’ll have another scar under your armpit if you have lymph nodes taken away. These scars will fade a bit over time. A wide local excision may not change the look of your breast too much. But in some women the breast might be smaller. The surgeon may need to operate on your other breast, so that they look similar. Your surgeon can tell you what to expect. They might be able to show you photos of what your breast is likely to look like afterwards. 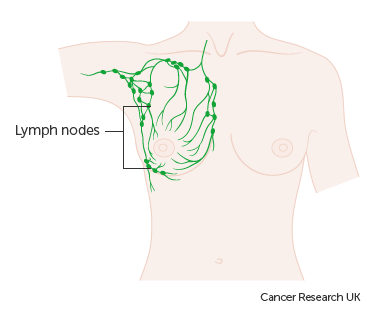 Cancer cells can sometimes spread into the lymph nodes close to the breast. You have an ultrasound scan of the lymph nodes under your arm when you are diagnosed with early breast cancer. If the nodes look abnormal, the doctor takes a sample and sends it to the laboratory to check for cancer cells. If cancer cells are in the lymph nodes, the surgeon will remove most or all of your lymph nodes at the same time as your wide local excision. This is called axillary lymph node dissection (ALND) or axillary clearance. If your lymph nodes look normal on ultrasound, your surgeon will check them during your operation to remove the breast cancer. A few hours before the operation, your doctor or a radiographer injects a small amount of mildly radioactive liquid into your breast close to the tumour. The radioactive liquid is called a tracer. During the operation, your surgeon might also inject a small amount of blue dye into the breast. The dye and the tracer drain away from the breast tissue into nearby lymph nodes. The surgeon can see which group of lymph nodes the dye reaches first. They also use a radioactive monitor to see which nodes the tracer reaches. They usually remove about 1 to 3 of these nodes. They send them to the laboratory to see if they contain cancer cells. The results can take about a week. The dye can stain your breast slightly blue. It gradually fades over a few weeks or months. The dye also turns your urine green for a few days. If none of the lymph nodes contain cancer cells, you won’t need to have any more nodes taken out. If cancer cells are in the sentinel nodes, you have another operation to remove most or all of the lymph nodes under your arm. This is generally about 2 weeks after you get the results. Some people have radiotherapy to the armpit to destroy any remaining cancer cells instead of surgery. In some hospitals, the surgeon gets the results of the sentinel lymph node biopsy during the operation. They can then remove the rest of the nodes if necessary and you avoid having a second operation. Instead of sentinel lymph node biopsy, your surgeon might take a sample of 4 or more lymph nodes from under your arm to check for cancer cells. This is called axillary sampling. They might use a blue dye to help to find the nodes. Research is looking at treatment of the lymph nodes during and after breast surgery.